Each box contains specially selected all new supplies needed to provide people with a head start in recovering from a disaster, or other adversity, or to start working for themselves for the first time. 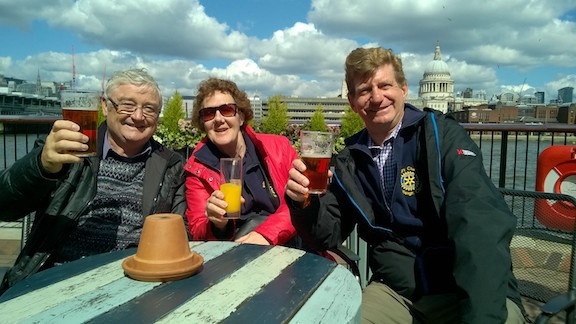 The Walk took place on the 17th April in fine warm weather crossing the Thames from Westminster to Tower bridge, finishing in St Katherine Dock. During the walk 25 quiz questions needed answers which could be found on route with M&S voucher prize for the most correct answers plus a further M&S voucher for highest sponsorship raised, all walkers took part and there were three joint winners, the winners all answered 22 questions correctly and so a tie breaker question was set to guess the number of steps taken during the walk as recorded by the organisers. 32 walkers took part and several donation and sponsorship monies were added to the total raised for the charity which currently stands at £700 plus any gift aid we maybe able to add.